Despina Apartment! Walking distance to beaches, restaurants & shops! Sea View! Property 18: Despina Apartment! Walking distance to beaches, restaurants & shops! Sea View! 2 bedroom cosy lodge, minutes away from the sea! Property 24: 2 bedroom cosy lodge, minutes away from the sea! Studio 5 min distance from the beach ''UB1Y"
Property 25: Studio 5 min distance from the beach ''UB1Y"
Loggia Loft Apartment, in the old Town of Rethymno! Property 29: Loggia Loft Apartment, in the old Town of Rethymno! Το Angela Apartment είναι ένα διαμέρισμα πλήρως ανακαινισμένο 58 τ.μέτρων. Property 43: Το Angela Apartment είναι ένα διαμέρισμα πλήρως ανακαινισμένο 58 τ.μέτρων. The Agora suite was perfection. The kitchen had all you need, including fresh bread and treats from the owner. The suite was spacious and right in the heart of the old town and the only noise we could hear was the church bells tolling. The owner, Marinos, was very knowledgeable about the area and provided recommendations on all types of activities. While here check out Angeli's gelato. 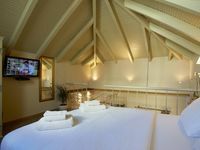 We'd highly recommend this place, look at www.casamaistra.com to see all the available suites. Might be better rates booking directly.